Location: Located in the centre of Sunny Beach, 50 m. from the spectacular beach, 25 km. from Bourgas Airport and 60 km from the Varna Airport. Accommodation: 150 double rooms and 144 apartments. Each room has satellite/cable TV, Internet access, mini bar, hair-dryer, balcony. information, business centre, conference rooms, restaurant, cafe/bistro, lobby bar, pool bar, elevator. park, fitness centre, indoor swimming pool, outdoor swimming pool, steam bath, solarium, sauna, massage, jacuzzi, medical and spa centre, spa and climatic treatment. 3 outdoor swimming pools, Indoor swimming pool with jacuzzi, Spa area of 1,200 sq.m., 8 massage cabins, Turkish bath, Steam bath, 2 saunas, 2 solariums. 9.000 sq.m. of gardens. Wow, nice hotel. Barcelo Royal Beach Hotel is such beautiful hotel.There is hugh echo in the indors swimming pool. Service is excellent. 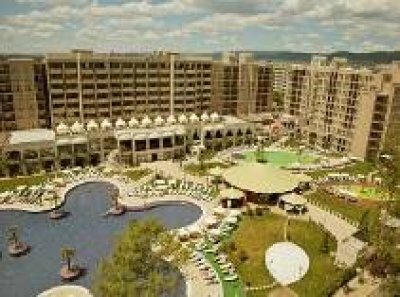 we operate charter flight to Sunny Beach ( Burgas ) & I need the web address of hotel as I am offering your hotel to Iranian tourist .I need very urgently . No 257 , Farvardin Cross Road , Jomhori Ave .
Well, nice lobby, but that's all 5 star you will see, sun goes out of the garden yearly in the day, swimmingpools are very cold, inddors are Ok, but very small and only one screeming child can spoil your day in there as ther are hugh echo in the indors swimming pool. Service OK, I'm stayng at the hotel righ now..